Pull-up bars are recommended for completing an intense upper body workout even when you are at home. This simple equipment allows the use of the weight of your own body. Among the advantages that you can expect in using a pull-up bar is that it is both inexpensive and useful enough to ensure that anyone who is serious about achieving a well-sculpted physique will certainly get what they want. Since there are a number of different types of pull-up bars, choosing one that will fit your personal needs and preferences can turn out to be a challenging task. For this reason, I have created a list which will help you identify the best pull-up bars in India (that you can also buy online). In case you’re in a hurry, here are my top three recommendations for the best pull-up bars in India. Still confused about which pull-up bar is best for you? 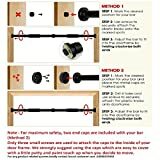 Let me help by providing detailed reviews on the best pull-up bars that I found in the market (and the ones you can buy online). For each pull-up bar covered in this article, I have covered details that should help you decide whether it’s a right fit for you or not. Below is the table that shows all the pull-up bars covered in this review. Now let’s have a look at the detailed reviews of each of the pull-up bar covered in this article. Includes Non-Weight Bearing Brackets for Sit-ups. If you are interested in getting that lean look, then the Cosco door bar is no doubt a perfect option for you. Among the features that make it interesting includes Comfortable foam handles, allowing you to experience a strong yet comfortable grip, thus reducing the slip caused by having sweaty palms. This equipment also helps in reducing the strain on the hands. It has a powder coated substance which provides a guarantee of its resistance against corrosion. Overall, it is adjustable, durable and fit snugly in between the door frames of your home. 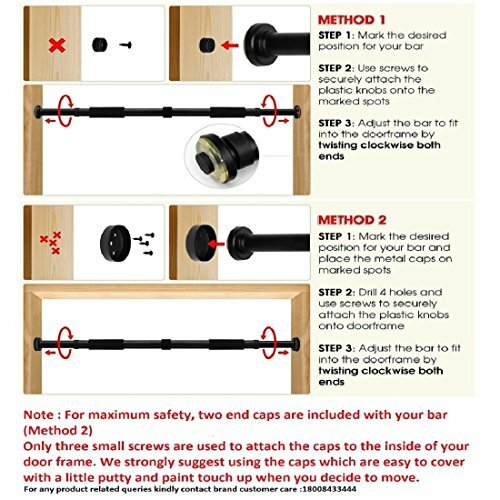 If you are searching for a high-quality adjustable door bar, then this horizontal and adjustable pull-up bar can turn out to be your best option. For one, it offers non-slip and soft padded hand grips, thus reducing the slippery effect that can be annoying at the same time. 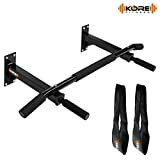 It is also designed in a way that ensures maximum stability and grip, making it an ideal equipment for activities such as chin-ups, pull-ups, and leg lifts. It is also perfect for crunches, sit-ups and foot anchor. This equipment is also safe from corrosion because it is coated with a corrosion resistant substance, protecting your equipment for long-term use. For this multi-door gym bar, there are two color options available, which means that you can choose the best one that will fit your personal preferences. It is constructed using sturdy steel material which has the capacity to hold an overall body weight of up to 100 kg. It also uses a black powder coating finish, thus ensuring an attractive, durable and non-slip surface which can stay longer in use even under any type of weather condition. This rod is adjustable between 81 and 120 cm. It also features a non-slip surface which ensures that you will not face any annoying incidents while using this pull-up bar. 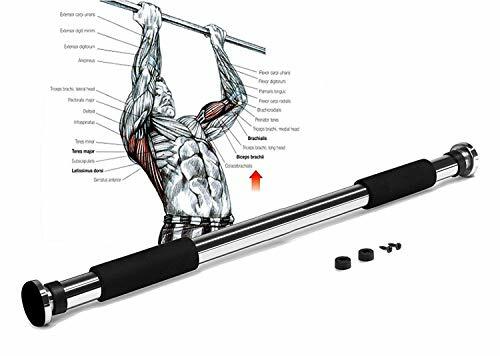 If a premium exercise pull-up bar is what you are searching for, this model from Fitkit is no doubt a good option that you can take into consideration. This equipment offers 5 different workout options. This includes upper body stretch, hip and knee stretch, spine arch stretch, and full body stretch. 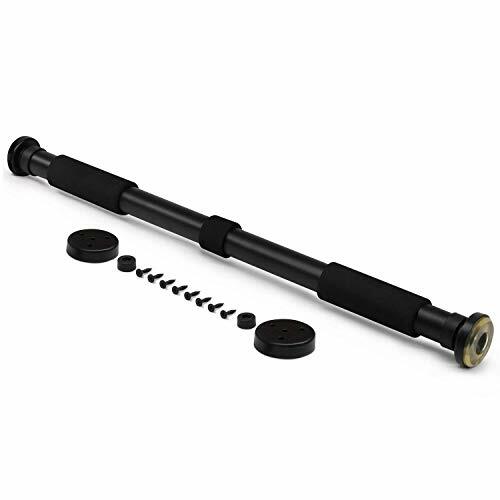 Fitkit will help you in developing your back, shoulders, and arms, thanks to its sturdy, heavy duty steel construction, combined with comfortable foam grips. This tool is also designed to increase the upper body strength, as well as the stamina in your shoulders and arms. All you need to do is to add just a few sessions using this tool into your routine. If you are want to maximize the effectiveness of your workout, you need to use an equipment that will allow you to experience an enhanced regimen. 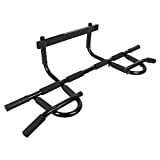 This multi-door gym bar from Dolphy is designed to increase your upper body strength and stamina in your shoulders and arms. 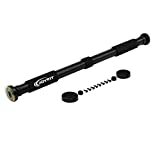 This tool has been designed for easy use, designed for use right at home, or in the gym, helping you to improve and achieve a complete workout by increasing the power in your shoulders. It is also designed to handle the weight of up to 100 kg. Pull-up bars like this model from LXOICE are designed to sculpt muscle across your chest quite rapidly. It works in activating multiple muscle groups simultaneously in a single motion while triggering metabolism for tremendous muscle gains and maximum fat-burning effect. This model is designed for ease of use. For example, it helps in altering your grip to vary resistance, while targeting various muscle groups. You may also opt to use accessories which can further expand your options on the workout while helping you to reach your goals even though you may consider yourself as a newbie. This mounting chin up bar from Kore K is designed to strengthen and build your biceps, back, shoulders, arms, as well as other upper body muscles. The best part is that there is no need for you to leave the very comfort of your own home. It comes as a complete pull-up station package, complete with everything that you need. Now you can finally set up your very own gym at home with this chin-up bar. It is easy to mount, and ideal for various workout options. It also comes with six-point foam grips, using its non-slip padded handgrips, thus providing a comfortable and secure grip, thus preventing sliding during your workout. Have you always wanted to experience the benefits offered by performing pull-up exercises? 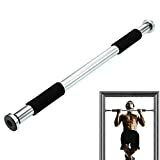 This pulls up bar from Joy fit will certainly help you out. This equipment is designed to prevent back pain and injury, strengthening major muscle groups in your arms. It also helps in increasing the rate at which calories are burned. This equipment is constructed using steel body materials, guaranteeing durability. It also features a strong grip, thanks to it’s non-slip and extra-long foam grips for better support, while minimizing hand pain or fatigue. It is also designed to absorb sweat or getting injured during the exercise. 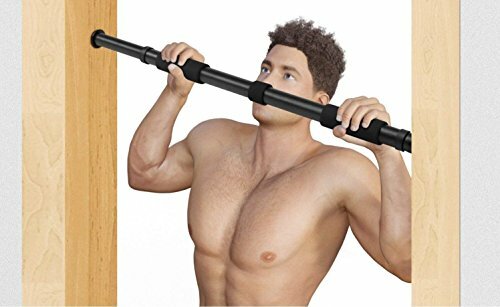 This multi-grip chin up bar comes with a number of interesting features. This includes 8 padded foam grips which ensure comfort against your hands. It also comes with heavy-duty steel construction, together with black powder coating, thus preventing corrosion and rust. 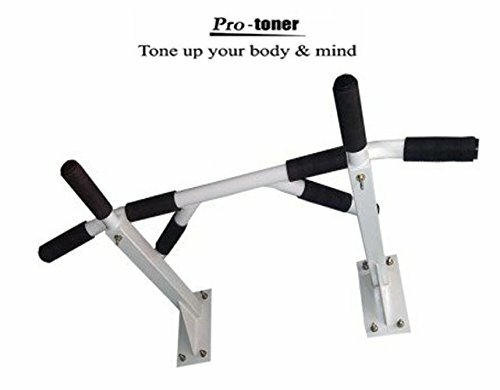 As such, this equipment is ideal for various workouts, including push-ups, pull-ups, chin-ups, and crunches, thus aiming towards your back, chest, shoulder, triceps, arms, biceps and abs. It also comes with four grip positions for ease of use. The manufacturer of this equipment, Strauss, focuses on developing a holistic approach towards achieving a balanced and healthy mind and body. This can be achieved by expressing passion through fitness, using this adjustable pull-up door bar. This model offers a variety of workout options. Among other features include the use of foam padded grips, offering the needed grip in order to do pull-ups properly. Among the benefits that you can experience when using this door bar is the presence of safety features. This model is very easy to install. In fact, you only need a screwdriver to complete setup, installing it in just a few minutes. The safety end caps are designed to keep your door from being marked up or damaged while making sure that you are kept safe during a workout. As you continue to use pull-up bars, you are strengthening your back and core muscles, thus resulting in better posture. As the posture of your body improves, you tend to appear leaner and longer. This will then result in several other things, including confidence and self-esteem. Every day, humans perform a wide range of movements and actions. This includes walking, standing, pulling, pushing, turning, twisting, and others. By using pull-up bars, functional strength is also proved through the performance of dynamic compound exercises, thus strengthening the relationship between the muscular and nervous systems. A lot of people sit a lot, sitting at work, sitting in front of a computer, sitting while driving. Even at home, you may even find yourself sitting on the couch all the time while watching your favorite shows. All of these activities can accumulate sitting, thus increasing the physiological load and burden on your back. As you strengthen your core and back muscles with the pull-up, you may also reduce any potential chances of injury and back pain in the future. Have you always wanted to look amazing in that new tank top that you just bought? Pull-up bars help in defining your biceps and back while working your core at the same time. Regular pull-ups help in making your waist look a lot smaller. It even helps in creating that “V” shape. If you consider yourself as a serious bodybuilding, having good grip strength is no doubt a must. This is offered by pull-ups, making it the best exercise that can strengthen your grip. As a compound upper body exercise, using pull-up bars target multiple muscle groups. Indeed, when it comes to the best pull-up bar that you can purchase in India, there are a number of options that you can take into consideration. Each of these options offers different features, advantages, and disadvantages, which means that it is up to you to choose the best one that will fit both your needs and preferences. Since most of the products are somewhat similar, it is up to you to do your homework in order to see what other people are also thinking about certain products. Starting with a list that includes features that you would like to see is a good thing to do, and start comparing it with the features of the products included in this list. Best Weighing Machine for Home in India. 10 Best Exercise Cycles for Home in India. 10 Best Elliptical Trainers in India (for Home Use). Best Treadmill for Home Use in India.